A couple of photo’s showing progress on my build. Just about to modify the first motion shaft on the ford gearbox and the GT6 bellhousing to accept each other. 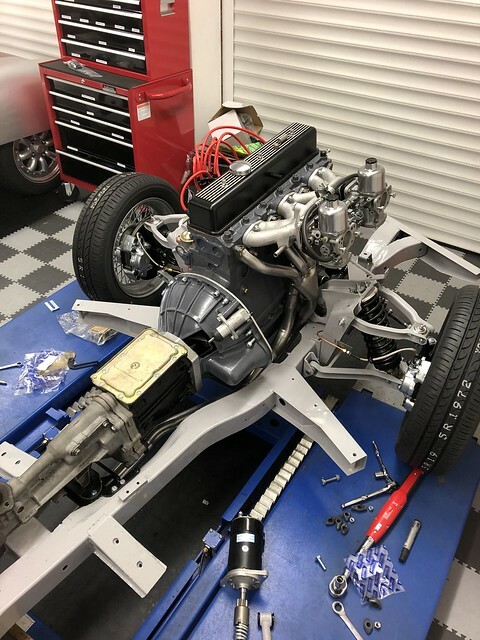 Rebuilt straight six is about a week away, brake and fuel lines about to be plumbed in. Looking forward to getting the Spit body back on to create space in the garage!! 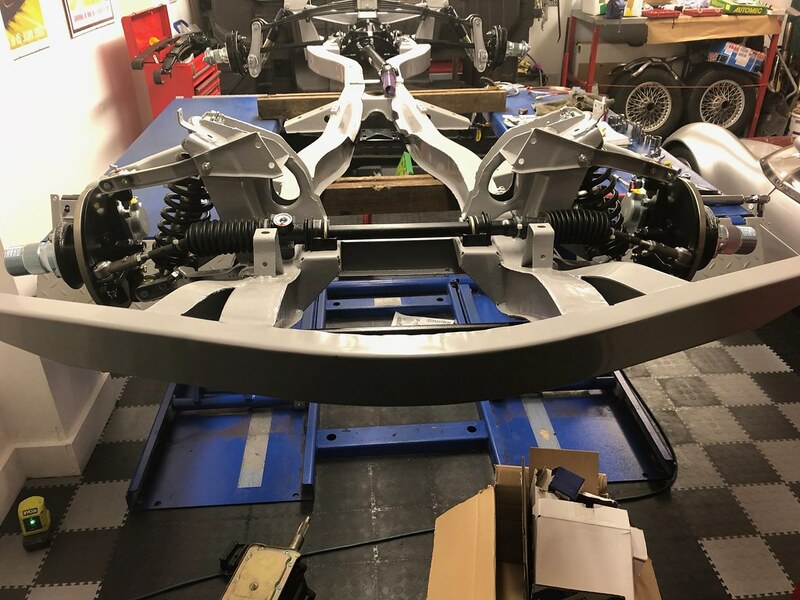 Last edited by Wardy50; 14th February 2018 at 09:40..
Wardy50 - Your chassis looks amazing. Thanks for the comments - it's taken way longer than I thought to get to this stage, and the car seemed to be really fighting me at some points. With regard to wheel sizes, has anybody fitted 15" and what tyre size did you fit. Subsequently were there any issues with clearance in the arches?? I'm planning on losing most of the rear inner arches anyway as they are pretty nasty. 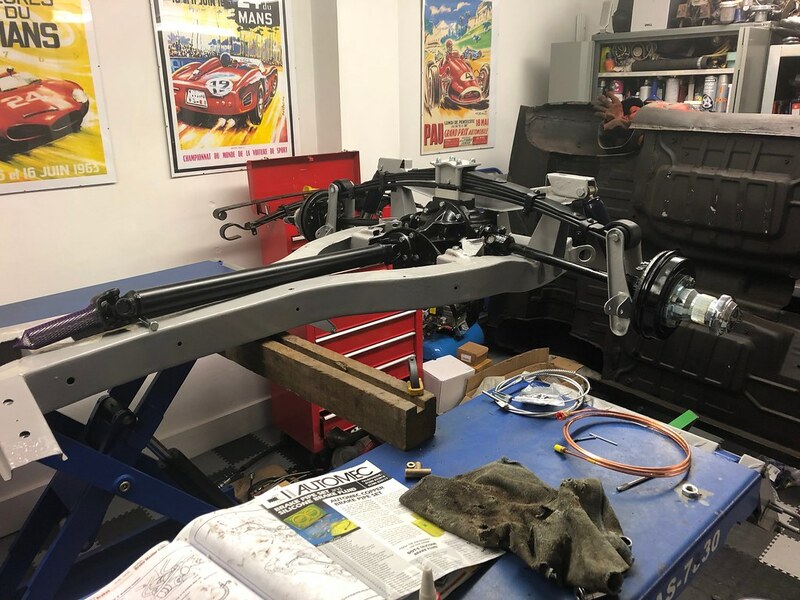 I fitted 15" wires to my herald based 352 the tires are Firestone 165 R15 86T and yes they will foul the front chassis on full lock If you look at page 8 of my build you will see how to sort it out I eventually used 40mm long sliding stops. you may also need wheel spacers to bring the wheels closer to the edge of the arches I used cheapo 32mm ones of ebay but will change them for some quality ones before it goes on the road. With regard to wheel sizes, has anybody fitted 15" and what tyre size did you fit. Subsequently were there any issues with clearance in the arches?? I fitted 15" TR6 wheels to my A352. I used hub adaptors after swapping the wheel studs for Range Rover ones, these increased the track about 15mm each side. I put hose clips on the outer ends of the rack to limit the lock but the tyres still fouled on the footwell part of the bulkhead, which I had to cut away and recess a good inch. I first made the panel to fill this hole from thin ally, flattened it and used it as a template for the galvanised steel item which was seam welded. It still needed a little cold dressing with a lump hammer before I was happy with the clearance. I'm fitting 15" MGF wheels to my Spitfire chassied Moss Monaco, as the PCD is also 3.75". I'm using Range Rover studs and nuts again, but, with the open wheeler design, fouling won't be a problem other than on full lock. I'll use the hose clip trick again to combat this. Thanks for the responses on the wheel sizes and clearances. Did you both fit the offset hub adapters that are available, or the standard?? I opted for the offset ones which I'm thinking does away with the need for the spacers?? I'll try and post a pic later. I'm also thinking of playing with tyre sizes to reduce fouling. By my calc's the standard 13" wheels, fitted with say 165 wide and 80 aspect tyres, would have a rolling diameter of 595mm. The 15" wheels, again fitted with 165 wide but 65 aspect tyres, would again have a rolling diameter of 595mm. I appreciate your input on this gents based on your previous experience - to save me re-inventing the wheel as it were!! Did you both fit the offset hub adapters that are available, or the standard?? This post details which adaptors I bought, and the problems that I encountered fitting them. no offset on mine as far as I know I bought them as a complete set off a friend. 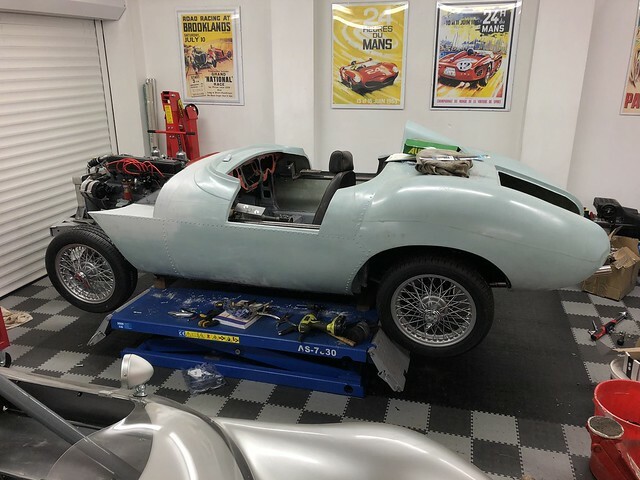 Which were fitted to a Burlington arrow (abandoned project) and the tires are quite narrow so wheel spacers definitely needed, I will also be fitting the longer spitfire 1500 drive shafts which I have recently rebuilt. Think I've finally decided on which way to go with the wheels after a bit of research!! Going with 4.5J x 15" with 165/60/15 tyres. I reckon this is a 579mm rolling diameter, with the original GT6 with 13" wires having a rolling diameter of 575mm. Mick I reckon your set up with the larger profiles bought you in at around 630mm, hence the contact issues. I do fully understand the logic in the selection though, and the period look of that profile. 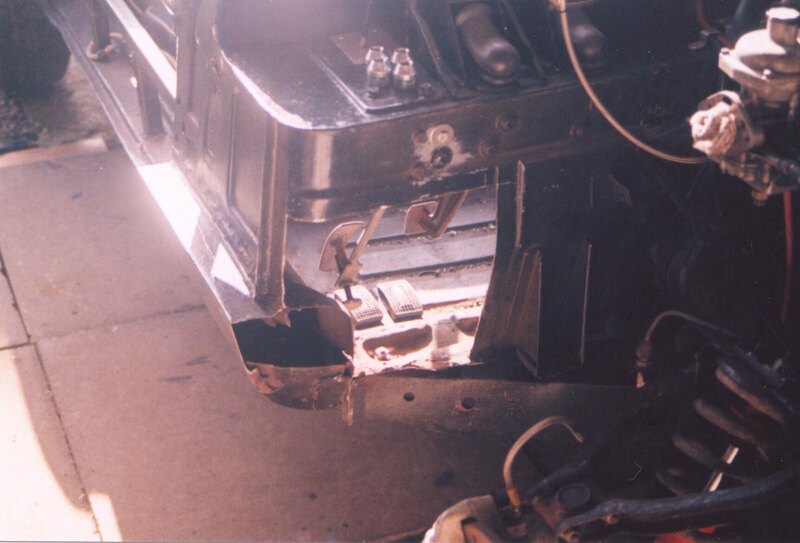 I just don't know if after all the body and bulkhead repairs I carried out if I'm prepared to hack into them again!! 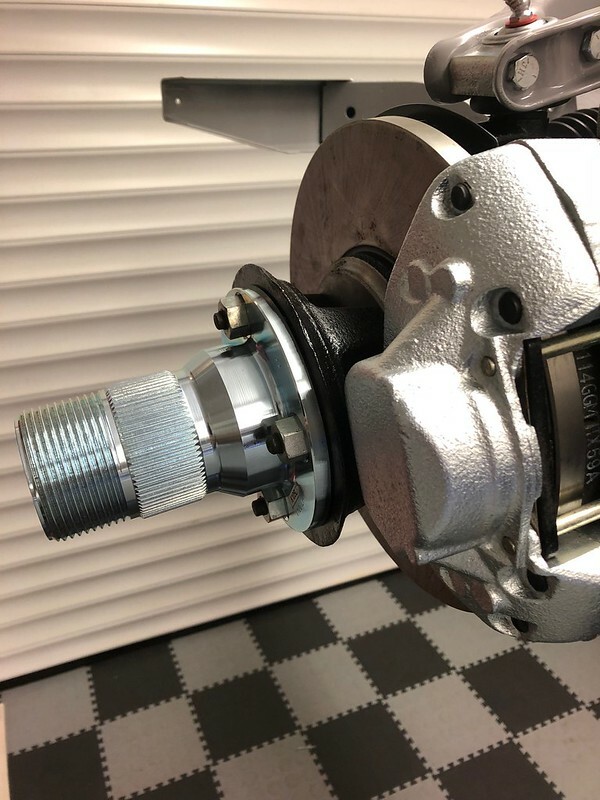 These are the offset spline adapters I fitted for information to accommodate the 14 or 15" wire wheels, the standard ones for Triumph 13" are simply not long enough for the splined 42mm MG fitment. Once again thanks for all the info on your builds gents. 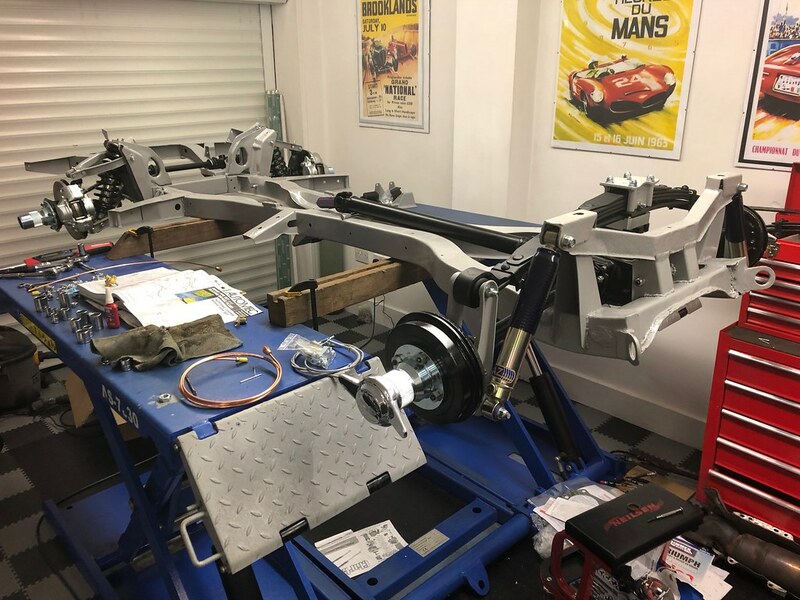 Good evening all, just a quick update on the build. feels like a momentous day as the engine's now in with most of the ancillaries. A few hiccups where the engine guys had fitted the 2000TC sump instead of the GT6, which led to a few clashes until I realised. Also had to play about with the engine mounts and move a few of the front brake lines to accommodate. 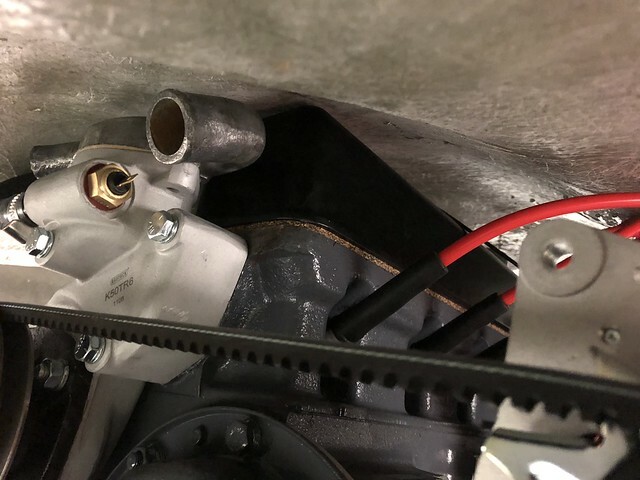 Exhaust will have to come off as one of the manifolds clashes with the front chassis upright, but still overall pleased with such a milestone moment. 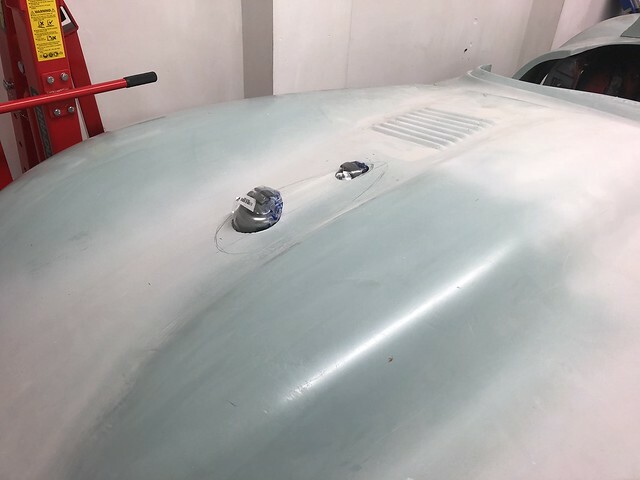 Thoughts now turn to getting the Spitfire tub back on and arranging to get the A352 body from Dan. 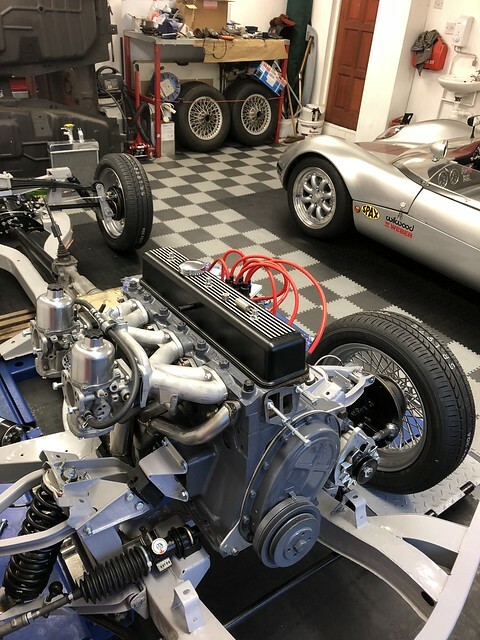 Steve – You have certainly created a high standard base for your A352. I’m also a little jealous of your garage, tools, skills, other car, etc. Many thanks for the reply, and your comments re the car. Build quality maybe OK from a distance - but don't look too close! I know I'm lucky having the space that I have to work in, I know a lot of these builds are carried out in rather more exposed positions! The other car is an ERA30H from Tiger, and is pretty much a road going race car. My wife refuses to set foot in it again, hence the A352 build to produce something a little more passenger friendly (doors, heater, windscreen etc). Anyway, need to pull my finger out now to avoid another missed summer! So the tubs back on, and after all the work on the chassis I can't say I'm overly pleased to see it there! Not the most pleasing look! Next jobs steering column and wheel back on, radiator and cooling hoses coupled up, fuel tank and lines plumbed in to carbs and then get the body on. Apparently there are a large number of 'domestic' items that require attention, so progress maybe delayed whilst brownie points are accrued! Bit more progress, and the body is on!! Fitting to the tub was relatively easy with no cutting or rework necessary. When it's on the deck though, its sitting high at the back (even though I fitted a 1" lowering block to the spring!) and needs lowering by about another 40mm, probably by modifying the vertical links and dropping the spring mounting points. Came to fit the bonnet though and things are not so good! The SU's will be fairly easy with a bonnet blister to suit, and I'll take the opportunity to use it as an air intake for the carbs too. The rocker cover not as simple. I'm thinking of cutting around the perimeter of the existing bulge, lifting and then glassing back in about an inch higher. Did anyone else get this, and if so what approach did you take?? I just can't get over the garage. Thanks for the response and advice, and yes I'm going to send some pics to Dan before I start cutting for his take on it. I can't see that it's wrong though (with respect to height) as it site nicely on the Spit tub front and rear, and the 'tabs' were right height on the bulkhead. The only thing I thought last night was maybe the body wasn't far enough forward, resulting in the bonnet also being pulled back hence the clashes?? This also doesn't ring true however as the main position indicator for the body is the fuel filler 'dimple' to the original Spit filler hole. It's an odd one, as I know a few people have fitted the 6 cylinder with no issues. When I get an answer from Dan I'll post it for information. All times are GMT +0. The time now is 06:15.